Costumes and jewelry have always played a significant role in adding elements of drama, history, and beauty on-screen. We decided to take a closer look at the famous necklaces that have impressed us both in fantasy and reality. Prior to sending items to GIA for a professional grading, our team of experts evaluates pieces of jewelry every day to the benefit of our buyers and sellers alike. While most of these pieces are fictional, see how our jewelry experts were able to estimate their value. We started our team off with one of the most popular necklaces in movie history. Titanic’s Heart of the Ocean features a big and beautiful blue diamond, surrounded by small white ones, on a diamond-studded necklace. The Heart of the Ocean Necklace worn in the film Titanic has a very interesting and complex history including a fictional history presented in the film, and the actual history of the necklace’s inspiration, the Hope Diamond. In the movie, the Heart of the Ocean was a rare blue diamond that was once worn in Louis XVI’s crown. The diamond goes missing after Louis XVI’s execution. It is later recovered and cut into a heart shape and becomes known as the Heart of the Ocean. This history is actually quite similar to that of the actual Hope Diamond, a 45.5CT blue diamond, with the difference being that it was a part of Louis XIV’s royal necklace rather than a crown. While the Heart of the Ocean is a completely fictional piece, both the necklace and the movie were inspired by a tragic love affair on the ship that involved a precious sapphire necklace. In the film, the size of the “Heart of the Ocean Diamond” measures at 56 carats. After the film’s success, Asprey & Garrard were commissioned to create an authentic Heart of the Ocean necklace, however they used a significantly larger center stone that was sapphire instead of a diamond. The commissioned piece includes a 171-carat heart-shaped Ceylon sapphire surrounded by 103 diamonds. The necklace was valued for up to $20 million at auction. The Hope Diamond, is currently valued at $250 million. All considerations included, our evaluators concluded that if the “Heart of the Ocean” necklace was indeed real, made with a real blue 56 ct. diamond surrounded by genuine colorless diamonds, the value would be higher than that of the 45.5 ct. Hope Diamond. Game of Thrones, a widely popular book series and an even bigger hit TV-show, is full of fantasy and drama. Adding to the fantastical plotlines and complex characters, are the elaborate costumes, hair, and makeup. 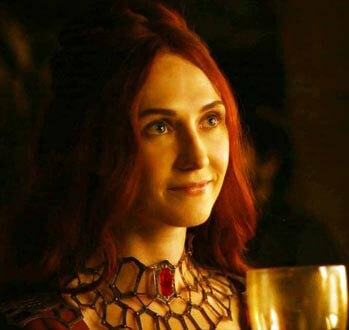 The Red Gold and Ruby necklace worn by the Red Woman/Priestess, Melisandre (Carice Van Houten) is particularly interesting, with a lot of historical and religious significance. As you can imagine, we were very curious as to how much a necklace like this might cost. HBO’s adaptation of Melisandre is played by Dutch actress Clarice Van Houten who is 5’ 7” (1.69 meters) tall. The average body is 7.5 – 8 heads tall which would give Clarice Van Houten a head height of roughly 8.6 inches. The dimensions of the ruby in Melisandre’s necklace are likely 1.5 x 0.7 x 0.2 inches. The ruby’s shape appears to be an elongated rough cut. A ruby of these dimensions would weigh roughly 27-28 carats. The cost of rubies varies wildly based not only on their weight, but also on their cut, color, clarity and natural state. “The Hope Ruby”, in a ring designed by Chaumet, is one of the most expensive unheated rubies ever to have been sold. Weighing in at 32.08 carats, the ruby was sold in 2012 at a charity auction for $6,742,440. According to the books, the necklace itself consists of red gold, roughly 50% gold and 50% copper. In the TV show, there are multiple settings for the necklace but we estimate the basic one weighs roughly 100 grams. Based on the points above, and the current value of a natural untreated ruby (up to 22,200 per carat), we can get a rough dollar value for an exact copy of Melisandre’s necklace (powers not included). Don’t ask us to convert that to golden dragons though. Remember when ‘initial necklaces’ were all the rage? Well, it wouldn’t be the first time. Dating as far back as the 1520’s, right around the time of Henry VIII, personalized jewelry was incredibly popular. One of the most prominent pieces is the gold and pearl ‘B’ necklace worn by Anne Boleyn. There is speculation that the famous portrait with the ‘B’ necklace was not of Boleyn- that it was another tudor with the family name, Brandon. Despite this theory the necklace is featured in the movie ‘The Other Boleyn Girl’ (Natalie Portman). This necklace, among a few others including an ‘AB’ necklace and an ‘H’ chain necklace that Henry VIII wore were eventually passed to their daughter Elizabeth and is seen in several of her portraits. The necklace itself is simple, and the materials might not command a large valuation on their own. Depending on the quality of the pearls, the necklace could range from as low as $2,500 to as high as $50,000. Given the timeframe of the portraits that it is seen in, the ‘B’ was probably made in the 1520’s, and would be nearly 500 years old by now. Going entirely off of the paintings and the artists’ interpretations, the pearls are nearly spherical and symmetrical showing us that they are saltwater pearls, far more valuable than freshwater pearls cultivated in nearby Scotland at the time. If the interpretation was accurate, they were likely sourced elsewhere and imported. A 16th century pendant made of similar materials sold for $25,000 at auction in 2012, without as rich a history. The value of this piece is more in the history rather than the materials. The infamy of Anne Boleyn and the modern fascination with the tragic story surrounding her would likely increase the value significantly. Getting a solid estimate on this piece is challenging, in part due lack of confirmation of the materials, but also the great intrigue surrounding Boleyn. While we can safely estimate a lower bound materially, the range can be quite large when considering the history of the piece, namely the story of its owner and the fact that it has been missing for quite some time. In one of the most famous movie scenes in American cinema, Vivian (Julia Roberts) is presented with a stunning ruby and diamond necklace, so beautiful, that she is at first apprehensive to touch it. This of course is immediately followed by that unforgettable laugh as the box is snapped shut. This laugh is so genuine, and so lovable because this was actually a practical joke on Julia Roberts. The director, whose idea it was, said that “When she laughs, the whole world lights up.” The movie just couldn’t do without it. The necklace is made with 23 pear-cut rubies set in the centers of diamond encrusted hearts, set in 18k white gold. The necklace was custom made by French jeweler Fred Joaillier. Such an iconic piece from such a famous movie would be worth more than the piece normally would – to the right buyer of course. At the time, the necklace was estimated to be worth between $440,000- $1,000,000. Gemstones and diamonds are priced per carat but as the stone gets bigger, the per carat price goes up so that, for instance, three one-carat diamonds wouldn’t cost nearly as much as one three-carat diamond. While the style of the necklace is outdated, the connection to the film is still very present. Thus, the necklace would likely be a piece for display or a collection rather than for formal-wear. No matter the materials or the style, the value is in the famous Julia Roberts laugh that brings beauty and life to this sensational piece. 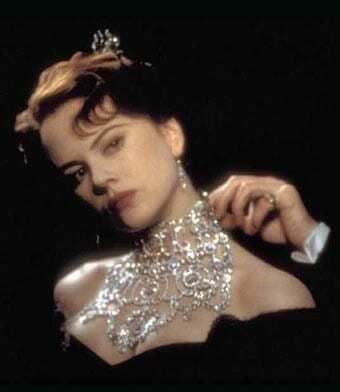 The elaborate diamond necklace worn by Nicole Kidman in the movie Moulin Rouge is nothing short of dripping with diamonds. The ‘Satine’ necklace is the most expensive piece of jewelry made for a film. This necklace, while made for a movie set in a specific time period, is not fictional in the least. It is quite real boasting 1,308 diamonds with a total carat weight of 134. Even the production of the necklace was carried out with 100-year old crafting techniques and took months to complete. Includes 1,308 Diamonds – 134 carats total, set in platinum with a 2.5 carat sapphire clasp. Was handcrafted and took more than 4 months to make. Was expected to sell for nearly $1 million at a New York jewelry auction before being withheld by the designer, Stefano Centuri who did not want to part with his masterpiece. The worth of this necklace, similar to the items sold through Worthy, is entirely dependent on the auction. While it was expected to sell for $1 million, it could have exceeded expectations at the auction itself. That being said, this necklace is worth far more than the sum of its parts, as it was clearly priceless to the designer Stefano Centuri. Audrey Hepburn’s beautiful pearl necklace is arguably one of the most iconic necklaces in movie history , and doesn’t need any introduction. Hepburn’s portrayal of Capote’s Holly Golightly simply wouldn’t have been complete without the stunning strands of pearls and large diamond brooch at her neck. 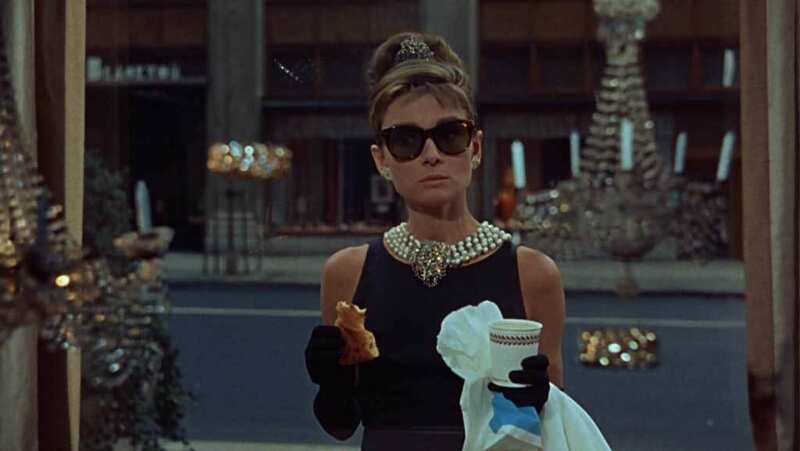 Holly Golightly’s pearl necklace is made up of somewhere between 100-120 pearls with a diamond brooch in the middle. Pearls are a challenge to value without physically examining them. The price of a pearl depends on many different factors. For example: Are the pearls freshwater, saltwater akoya, or south sea? Are they round, near-round, or semi-round? How good are the pearls’ lustre and surface quality? A low-quality freshwater pearl can cost as little as $4 dollars. On the other hand, in 1917 Pierre Cartier started his now world-renowned jewelry company by selling a 128 pearl necklace which was valued at $1,000,000 ($18.5 million inflation adjusted). The problem in valuing this piece is that there are many unknowns. This is something that our experts encounter often as many individuals do not know the exact characteristics of what they have. That is why certain assumptions need to be made when providing an initial estimate, without physically seeing the item. How much do you think this necklace is worth? Well, that’s a wrap! Thank you for joining us as we explore some of our favorite famous necklaces through the eyes of our evaluators but, unfortunately, it’s time for them to get back to evaluating real items. What fantasy items are you curious about seeing in this light? Expensive and beautiful diamond jewellery. Love it! Jewelry gives an extra rich impact on the any story of the movie. We have seen the best example in the Titanic movie and it has been a successful concept.